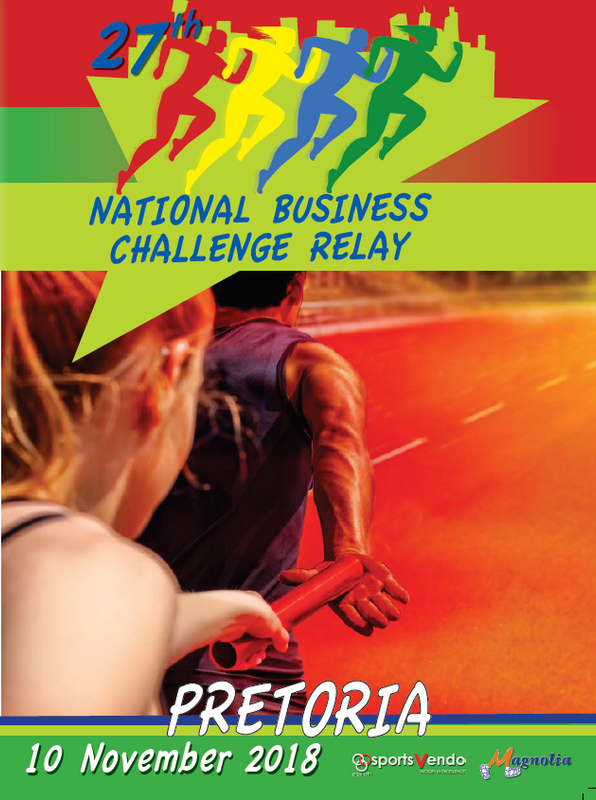 National Business Challenge - Relay | Entry Ninja – the best outdoor, fitness and sporting event entries in your area. Teamwork has become the central focus in all successful business environments. Without the commitment to achieve a mutual goal and objective, even the most dynamic of environments will stagnate. This event is organised to promote company involvement and teamwork in the best spirit of competition. All participants are encouraged to wear their company t-shirt and rally non-competing co-workers to the race site to cheer their team to victory. The distance of the course for running teams is a standard 42.2km marathon and for walking teams it will be 21.1km. The distance of each leg is +/- 7km. The same changeover, located at the venue will be used throughout the day. Running teams: Teams consist of six employees/ runners each running a different leg of +/- 7km. Walking teams: Teams consist of three employees/ runners each walking a different leg of +/- 7km. The race pack consists of race numbers, race baton,sash (for walkers) and final instructions. This will take place between 10:30 and 11:30 at the venue. A number of packages are available. Refer to the Hospitality Reservations booking Form for detail. The entry form and hospitality area reservation form can be downloaded at www.sportsvendo.co.za or contact the National Business Challenge Relay Head Office listed under enquiries. Order specially designed colour printed T-shirts for only R70.00 each and collect them at registration. Hospitality sites are reserved for teams and supporters to relax after the relay. Men: All team members must be men and older that 20 years. Women: All team members must be women and older that 20 years. Mixed (walking): Any combination of men and women older than 20 years. Mixed (running): A minimum of two women older than 20 years. Veteran: All members over the age of 40 years, any combination of men and women. 1.2 Teams consist of six/three members, each competing in one leg. A team member can, however, participate in more than one team, as long as he/she competes in one leg per team. 1.3 All six/three members must belong to the same organisation. Each team member must be a bona fide employee/employer, and must have been working at least three months prior to the date of the race for the organisation they are representing. 1.4 Organisations with less than ten employees participating in the corporate categories are entitled to join forces with another organisation in the same trade, also employing not more than ten people, in order to make up a team. In this case the name of the organisation that has the most participants in the team must be indicated on the entry form. 2.1 All teams must qualify in terms of the business categories listed on the entry form.Organisations (listed or not listed on the JSE) must enter the categories applicable to the nature of their business and not individual departments or job functions. 2.2 The category, Education is for employees of educational institutions and not for students/scholars. 3.1 All scholars & students in teams must belong to the same school, university/college and must be between 9 years & 20 years old. All six/three members must enter either as boys/girls or men/women. No mixed category. 4.1 Open categories are for non-corporate teams such as sports clubs, business clients, churches, family and friends. 4.2 Participants compete in the three basic categories: Men, women and mixed teams. Rule 1.1 applies to the composition of these three categories. All teams will receive a race pack containing race numbers, baton & sash (walkers) at registration (refer to information). Runners and walkers will wear the race number on the front of their vests/t-shirts. The person running/walking the first leg must start with the baton/sash. The baton/sash is the passed on to the next team members after every leg at the changeover. Teams not finishing with the baton/sash and correct coloured race number will be disqualified. Teams are encouraged to wear the colours of their organisation. Under no circumstances will seconding be allowed. Refreshment station(s) will be available along the route and at the changeover point. The race coordinators must be notifies in writing or by fax (not by telephone) of any team changes before 31 October 2018. The organisers reserve the right to return any entry not in keeping with the spirit of the race. The decision of the organisers will be final and no correspondence will be entered into. The event will continue regardless of weather conditions. In the unlikely event of the race not continuing (due to a natural or other disaster, or for the safety reasons), no refunds will be payable. All team members participate at their own risk and indemnify the organisers, producers, sponsors, national and provincial sports bodies of any claims which might arise. It is the responsibility of each participant to ensure that he/she is medically fit to participate (run/walk) and to consult a doctor before training for and participating in the race. Medical service will be provided for participants. 9.1 Members of running teams may walk, BUT members of walking teams MAY NOT run. 9.2 Walking teams will participate under general rules of the road walking and running teams under general rules of road running. It is each participant's responsibility to be acquainted with these rules. 9.3 The event is organised in cooperation with AGN. This event supports team entries for certain classes. Team sizes range from 3 - 6 participants per team.